Having the right atmosphere in your ride can make a huge difference and a genuine Kia interior illumination kit is a great way to personalize the atmosphere in your ride. Come get your Kia interior illumination kit in our Parts Department at Hanson Kia, just west of Lacey, WA. These high quality LED interior lights are designed specifically for your Kia model and they are typically easy to install. If you have any concerns about getting these interior light kits installed correctly, ask us about having the factory trained technicians in our Service Department take care of it for you. You'll be back on the road in no time. 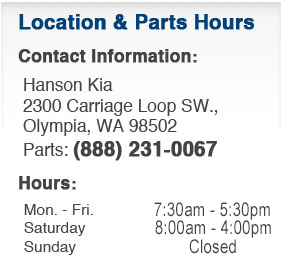 Come see us and find out how else we can help you improve your ride with genuine Kia parts and accessories from Hanson Kia next to Tumwater, WA. Your Kia came with one of the best warranties in the industry, which means it is engineered with the highest standards. When it comes to maintaining and improving this level of craftsmanship, it only makes sense to trust genuine Kia parts and accessories. Don't miss our updated Kia parts specials for the savings you need. Our Parts Department at Hanson Kia, north of Centralia, WA, is always well stocked with what you need to get the most from your quality Kia model. Consider taking a break and having our expert technicians take care of the parts installation for you. It won't cost much and our Service Department is always updating special offers to make your visit even easier. Come see how else we can help you with your Kia maintenance and repair at Hanson Kia, where the drive from Chehalis, WA is always worth it.